Not all people are the same, even in the world of sweetness. This recipe is coming from............... This book is devoted to the rice flour because the author wants to create the recipe that suitable for the people who allergic to wheat flour. I really love the idea even I don’t have any member in the family that allergic to wheat flour but using different kind of flour is quite interesting for me. 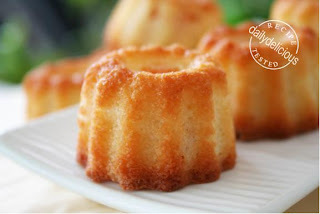 The rice flour and wheat flour are different so it not easy to replace the rice flour for the wheat flour without adjusting the moisture in the recipe, so if you don’t want to use rice flour in this recipe you will need 18g of cake flour than 16g of rice flour. PS. This is a super small recipe so you can double the quantity if you like. *If you don’t have almond powder, you can make it by processing the slivered almonds with the rice flour in a food processor until finely ground. Sift the rice flour and almond powder together. Butter the small muffin pan. Put the egg white in the bowl with the sugar and vanilla extract and whisk until thick and white. 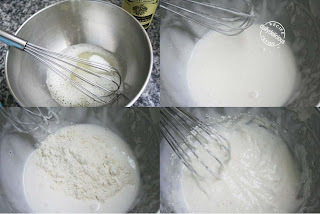 Pour the sifted almond powder and flour into the egg white mixture, using a whisk to combine. Pour the melted butter in and using a rubber spatula fold to combine. Bake the financiers for 20 minutes, until golden.